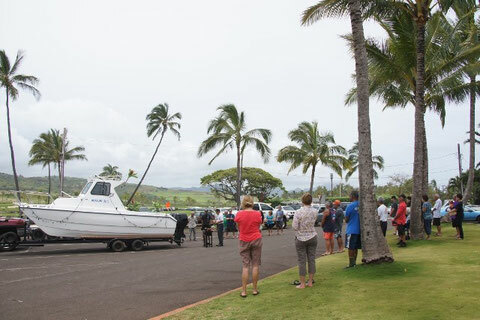 Yesterday, I had an honor to officiate the Blessing Service for a brand-new Boat. Because it was a rare opportunity, I asked my wife to come with me and to take a photo of the service. Before leaving here for the harbor, I imagined a traditional Buddhist robe would be important to make the service look better. My intention to take a photo, was I wanted to introduce a unique boat-blessing to our ministers in Japan. However , oh my goodness, I became white with shock when I realized I forgot to bring my robe and kesaya there!!! I thought I should go back to temple to get a robe but everybody seemed to gathered already...I had no choice but to start the service....without a robe. I should not excuse further, but, as for the blessing, it was OK to do the service without a robe since I had everything... a bell, incense, incense burner, and water. In addition, I can recite words of prayer by heart, which is the most important for the service. I just felt embarrassed and I thought I might feel more embarrassed if I show this photo to the ministers in Japan. So I asked my wife to take a picture next time and I asked not to take me this time. Now I think she did a good job that she didn't listen to me. She did take some pictures that I was doing the service. I am actually grateful to have some photos of the service because I cannot guarantee if there is any chance to do the blessing "next time." And this will be a good reminder that I'd better wear a traditional robe when I do have a service. At the same time, it will be a good record and memory for the family, too, if I share it . So I'm going to extend my Mahalo and Aloha with some photos to Mr. and Mrs. Sueoka who gave me an opportunity to do the service.